“Borshchagovsky Chemical and Pharmaceutical Factory” is among leaders of the pharmaceutical market in Ukraine. The trade mark “BHFZ” has been known as a quality and safety standard already to the third generation of Ukrainians. In turn, BHFZ imposes the highest quality and safety requirements to own suppliers’ products. 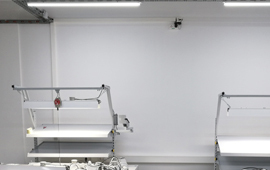 Our equipment was not an exception – they decided to choose our Company as a contractor for the lighting system modernization only after thorough testing and detailed design. Electricity savings after the implementation of LED lighting was 65%, mostly due to replaced lamps that were based on fluorescent technology. A special feature of BHFZ lighting was the illumination of clean rooms with strict requirements for dust and moisture protection. OSRAM LEDs were used in this project.